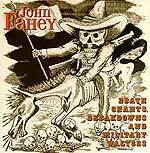 CD review: "Death Chants, Breakdowns and Military Marches"
John Fahey almost single-handedly invented the modern guitarist as solo instrumentalist of folk music. Before Fahey, the guitar was accompaniment to singing in the folk arena. Since he came on the scene in the early '60s, a whole new field of virtuosic soloists has sprung up  as evidenced by artists from Leo Kottke to Tuck Andress. Fantasy Records has been re-releasing Fahey's old LPs from the Takoma and Kicking Mule labels in CD format. None has been quite so interesting as "Death Chants, Breakdowns and Military Marches"  for this was an album that Fahey himself re-released with all new recordings of the same songs. Fantasy has done the only sane thing here and included both versions of the album (which was given the catalog number Takoma 1003 in both incarnations, offering evidence that Fahey wanted the 1967 version to simply replace the 1963 original). This offers the contemporary listener the opportunity to hear what Fahey was doing in two different parts of his career, to listen to both visions he had for this album. Different fans will have their own takes on which version of the album was better. What is clear is that on the 1967 set, Fahey was more intricate than the '63 flavor, darker, with a heavier overall sound. But each is worth a careful listen, both for the history and the sheer pleasure of hearing one of the best finger-picking guitarists this nation has ever produced.